Challenge and promote a deep conceptual understanding of chemistry concepts. Scaffold reasoning “from the molecule up”, from molecular behaviors and interactions, leading up to emergent group patterns. Focus on the behaviors at the particle level and on processes of change at the system level, distinguishing and typifying both equilibrium states and the dynamics of change. Support an understanding of symbolic/mathematical aspects and their connection to the chemical system's behavior. Provoke and facilitate the distinction and connection between models and the real world in science. Modeling a Tire: After generating a theoretical model of pumping up a bicycle tire, a part-by-part rule-by-rule acquaintance is made with the gas particles and container in the computer model, leading up to the KMT assumptions that are subsequently explored. 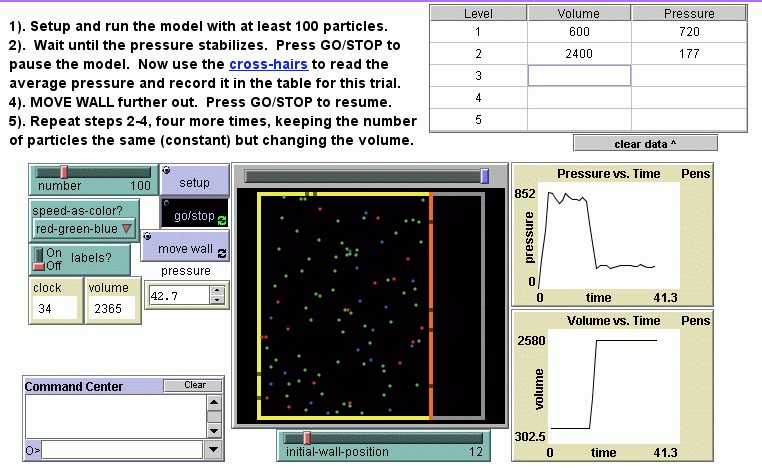 Changing pressure: The concept of pressure and its computation in the model are investigated; processes of change are explored--delays between perturbing the system, its reaction and gradual re-equilibration, relations between the randomness of the gas particles'motion and the stability of pressure in the system. Experimenting with particles: New tools are introduced--several simple NetLogo programming commands are used to change the particles' properties, enhance and change the visual representations; propagation of change in the system from a local perturbation is explored with mid-level models (models with a small number of particles, Levy & Wilensky, 2008); energy exchange and conservation is explored; experiments are selected, invented, designed and conducted. Number and pressure: The relationship between the number of particles in a fixed container and the pressure is investigated; an equation relating the two variables is constructed; the frequency at which individual particles hit the wall is compared and related to the pressure, problematizing the meaning of a linear relationship at the particulate level; the model and a real bicycle tire are compared along several dimensions and discussed in terms of affordances and limitations. Temperature and pressure: The concept of energy is explored further by relating changes of the gas temperature and the particles' speed; delays between heating the container and heating the gas are observed and explained; the qualitative and quantitative relationship between temperature and pressure is investigated. Volume and pressure: Boyle's Law is constructed and then tested. Several ideas are further explored--problematics related to the model's two-dimensional nature, relating the particles' random motion and the collective flow of gas into the vacuum formed when the model's container volume suddenly increases. Ideal gas law: The unit culminates with the construction of the Ideal Gas Law and further discussion and activities concerning the nature of models and modeling. Another rule is then added to the model - gravitational pull - and exploring a model of atmospheric pressure completes the module. More generally, the chemistry topics are set within a wider perspective of complex systems. The domain of 'complex systems' has evolved rapidly in the past 15 years, developing novel ideas and tools, and new ways of comprehending old phenomena, such as weather systems. Complex systems are made up of many elements (often named 'agents', in our case, molecules), which interact among themselves and with their environment. The interactions of numerous elements result in a higher-order or collective behavior. Although such systems are not regulated through central control, they self-organize in coherent global patterns. These patterns are often counter-intuitive and surprising. This project seeks to demonstrate the impact of an effective use of technology (within a student-centered, model-based curriculum) upon secondary science learning and teaching. The project results form a collaboration among three partners The central project site is the Concord Consortium, while the other sites include the Northwestern Center for Computer-Based Modeling and the Harvard Graduate School of Education. This partnership includes a number of secondary schools including Clemente High school and Park View school in Illinois, together with the Fitchburg Public Schools, the Lowell Public Schools at Massachusetts, and other schools that particpate in the project. Download the Pedagogica software you will need to run the activities on your computer. Levy, S.T. & Wilensky, U. (2008). Inventing a "mid-level" to make ends meet: Reasoning through the levels of complexity. Cognition & Instruction, 26(1), 1-47. Levy, S.T., Kim, H. & Wilensky, U. (2004). Connected Chemistry - A study of secondary students using agent-based models to learn Chemistry. In J. Gobert (Chair) and N. H. Sabelli (Discussant) Modeling Across the Curriculum (MAC): Technology, Pedagogy, Assessment, & Research. The annual meeting of the American Educational Research Association.